2nd Edition Revised and Enlarged in 2013. 576 pages - 8 1/2 x 11 and 1750 quality illustrations and photographs. All clock illustrations from the 1st Edition published in 1992, and many more, are now in 2nd Edition. "...Welch Clocks - 2nd Edition is a true TRIUMPH and Tran’s final work! It is undoubtedly "THE GUIDE" to all collectors. Thank you Tran..."
"...We are deeply indebted to Tran for the authoritative research that he has conducted over the last eight years in the development of Welch Clocks - 2nd Edition. His exhaustive research and meticulous attention to detail and comprehensive photographic documentation will serve future generations of collectors. You have set the "gold standard" for horological research. The additional material contained in his second edition is a must have publication for all serious clock collectors. I certainly hope that this is not your last book! The world of horology needs you..."
"...Welch Clocks - Second Edition is Tran and Vicky's best book yet. Hopefully, it will not be their last! Tran's attention to detail and accuracy offers an honest and detailed description of all of the Welch clocks that he has been able to locate. No one has done more in the area of identification of antique clocks than Tran has. The clock collecting world is truly indebted to Tran and Vicky..."
"...I attended the Florida Mid-Winter Regional this week and had a good look at the draft copy of the Welch book & was pleased to see the many fine additions & improvements in this edition. You have done Elisha N. Welch proud with this publication. This is your best book yet. This will be a great reference book for all Welch clock collectors..."
"...Congratulations, that’s wonderful to hear!! I read the reviews and it definitely sounds like quite a book! I think it’s amazing what you and Vicky have done on this new Welch Clocks - 2nd Edition as well as all the others. Good job!..." "... as always I will be very impressed with the Welch Clocks - 2nd Edition, the same standard and quality of all of your publications. I feel privileged to have been a customer of yours over the years, the service is second to none. I have collected your publications for over 25 years, and the high quality, detailed contents have been an imperative and valuable tool for identification of clocks over this time. I look forward to what looks like a really detailed and well developed addition to my collection..."
"... The new Welch Clocks - 2nd Edition arrived in perfect condition today and as usual I am delighted with the contents. I have all your books and sure hope you don't decide to retire now as your books are such treasures to we clock collectors..."
"... I received the book today and am very pleased with it! Thank you so much for packing so carefully and shipping so fast!!! I’m a Welch wooden kitchen/mantel clock collector, so I really appreciate all your hard work and am very grateful to get the book!..." "... I have been interested in all things related to Horology the past thirty five years. Purchasing and selling numerous clocks has been aided by having the right resource books. Over the years, I have collected all of Tran Duy Ly’s Clock Books including the Welch Clocks - 2nd Edition that I just received. These books have added to the joy of making sure that the clocks are as true as they were designed. To me, Tran Duy Ly’ Books are your number one clock resource!..." "...Thank you very much for my new Welch Book. It continues to follow the long tradition of the best identification and price guides ever produced. Your dedication to furthering the study of horology is unsurpassed. Very sorry to hear that this could be your last publication but with all of the work and time you have contributed to the study of horology you both deserve the rest!..." "...I received your wonderful Welch book today. Words cannot tell you how much I appreciate the book and I am so touched by the memorial to Bill--how pleased he would have been!!! All the memorial section is really nice and thoughtful and all the testimonials to you are TRUE. And so much information is amazing. It is a most beautiful book. What a contribution you have made over the years..."
"...Tran, got the Welch Clocks - 2nd Edition and read through it last night. I really enjoyed it, along with your signature. Thanks again..."
"...I just wanted to send you a little note thanking you for the 2nd edition of Welch Clocks, I received it today. I hope that the information and pictures in the new Welch Book continue to help collectors and enthusiasts alike for many years to come. The book came out great as I am sure it was quite the challenge to compile and archive all the information within its covers..."
"...I received my copy of the Welch Second Edition today. Thank you very much, you are truly a good man. I can't tell you how much I appreciate having my clocks included in the text, it feels like a bit of immortality to have my name out there in print forever..."
"...I received the Welch Clocks - 2nd Edition today and scanned through it tonight. It is incredible how much research and work you have put in it, but the result is a masterpiece. Once again you have provided a service to horologists world-wide whose value is incalculable. Long after you and I are gone, your name will live on and your labor will provide a tremendous resource for generations to come. Please accept my sincere appreciation for your labor, your tireless devotion to our beloved hobby and, most of all, your friendship. Your books are my first resource when identifying antique clocks and I cannot tell you how valuable they are when family and friends inquire about their timepieces and clocks. The Welch book completes my set of your works and I am thrilled to receive it..."
"...Thank you for the beautiful and expertly written and illustrated copy of your new Welch Clocks - 2nd Edition. We are proud and pleased to be part of this incredibly informative book by you! No other publication ANYWHERE can compare to your books! We are even more proud to be friends with you for these past decades! When ever I make reference in my workaday life to your volumes, and me being part of them, I do it with extreme pride and certainty, for you are the definitive source for so many important clocks and their history! No better, more concise, or comprehensive books than your books are to be found anywhere----The Very Best from our friend Mr Tran Duy Ly!..." "...I received the Welch Clocks - Second Edition today and I love it. I have all of your books now!..." "...Why it is wonderful, as are all your books. As you know I have been seriously buying and selling for over 25 years, and even selling as far back as 40 years. I could not have been nearly as successful if not for your books. I have referenced your books on every write-up of every clock, if I could find it in your books. Surely, I have helped make you successful also. It would be interesting to know how many people bought your books because of my references. We will never know. As we sink slowly into never never land I wish you guys the best. I don’t plan to quit until they carry me out of the house...."
"...Thank you so much for your Welch Clocks - Second Edition. I really DO love it..."
"...It is indeed a monumental master piece that you have created! There is so much new information you have provided, that I find it difficult to lay it aside while reading it in the evenings. We are sorry that this will be your last book to publish. But I understand there must be an end point of your life long endeavor. And as you say, age has snuck up on you. Enjoy retirement!..." handsome book and a wonderful addition to anyone's library. I am sad, however, to think it will be the last..."
"...I received your magnificent Welch Clocks - Second Edition, and can never thank you enough! It will always be treasured by me, and will travel with my great grand grandfather's clock to future generations of my family. Wishing you and Vicky the best of everything..."
"...Your Welch Clocks - 2nd Edition is excellent as I have made many intelligent purchases based on originality and being able to use the books for comparison..."
"...Dad cared much for you I can remember your name come up whenever we would ask him about clocks. He enjoyed the hobby so much that he came to our school and gave a great demonstration in our science class on the history of clocks and keeping time starting with sun dials, water clocks and how they worked, then moving onto the wind-up gear clocks, all the way through the ages. I'm happy that you became a good friend of his. We all miss him dearly and we will cherish the books you wrote along with Dad's input..."
"...I am very pleased with Welch Clocks - Second Edition by Tran Duy Ly which has been published in hardcover, February, 2013. This long-awaited book has good, clear pictures and over 250 pages of new and useful text compared to the first issue, a paperback, that dated to 1992. Indeed, Welch collectors had been hoping for an update for several years, and what they got is in keeping with Tran's usual research style: a well-organized book full of comments and descriptions of clocks, many previously unknown, lots of good pictures of movements, illustrations of special Welch pendulums, and a more up-to-date price list. In short, this is a handy reference tool that should be in every serious clock collector's library!..." "...I am a relatively new clock collector and finally ordered my first installment of Welch Clocks - Second Edition and other books by Tran Duy Ly to build my library. I have been extremely pleased with the books as a source of information and general interest for that matter too. The books are invaluable for researching potential purchases and gaining the comfort that I am getting the right clock for the right money..."
"...When I began collecting approximately 40 years ago there was little to no documentation on American Clocks. I was very glad to later find Palmers' clock book. It introduced me to many clocks I knew nothing about. When Ehrhardt published books with many clock details that I had never known before, I thought it can't get any better than this for clock documentation. Then I met you at the Denver Regional in 1991 and purchased your first edition book on Waterbury clocks. What a significant discovery for me. Since then I have acquired almost all of your books including the Welch Clocks - 2nd Edition I just received and they are the backbone of my library. I am much better informed because of them and my experiences with clocks would have not been as exciting and satisfying without them. My main interest has been in Ansonia clocks. My copy of your second edition Ansonia book shows a lot of honest wear as I use it all the time and carry it whenever I travel. Thank you for the added pleasure of having the information in your books readily available to me as I pursue this very enjoyable part of my life..."
"...Thanks so much for the copy of your new book on Welch Clocks - 2nd Edition. It will occupy a respected place on my bookshelf with the rest of your books! My best regards to you and your family..."
"...Once again you have made an outstanding contribution to not only the clock collectors fraternity but to any and all those interested in the many aspects of clock collecting. Its a great pleasure to see you back in the swing of things and doing what I am sure gives you the greatest pleasure. To date I have only scratched the surface of this great book and still I have found many examples of information never previously reported on. Many thanks for your Welch Clocks - 2nd Edition, stay healthy, all the best to you and your family. My warmest regards..."
"...I want to let you know that I think your Welch Clocks - Second Edition book is great! Many thanks for the fine photos and catalog pictures you have included..."
"...I just received your Welch Clocks 2nd edition. Thank you so much! As a Welch collector I have used your 1st edition almost daily over the years and it’s now worn and tattered, but since everything that was in the first edition appears in the 2nd edition (plus a lot more) I will retire it but definitely still keep it as a souvenir. I bought a Patti No. 3 French from Bob Reichel and it proudly sits in my family room. I am very sorry to hear that this might be your last publication, but I too am not getting any younger so I understand. Thank you again for your past efforts and for your effort in publishing this wonderful reference book and I wish you the very best in retirement..."
"...I just bought your new Welch Clocks - 2nd Edition and love it. I can say unreservedly that you have done more to promote clock collecting and to assist collectors and students of horology than any man living or dead. I want to thank you for your arduous work..."
"...An absolutely wonderful reference book for the collector interested in Welch Clocks. I was happy to be able to contribute to it with my clocks and vignettes of Welch notables. The publication reflects the years of work you put in it collecting the information and pictures, and it is absolutely wonderful that every clock listed in your 1st edition also appears in your 2nd edition. The price guide is an added bonus for those seeking to validate the market prices. A sincere thank you from a long time Welch collector. ..."
"...The Welch Clocks - 2nd Edition is as wonderful as all your other editions. I am sure many join me in saying that it is your best work..."
"...I just received the Welch Clocks - 2nd Edition and was very impressed by the inclusion of all the detailed photographs of movements and labels. It really helps when questions arise while checking the originality of a clock. The history section is well done including all the principles involved in the company and photos of the factories. Nice touch..."
"...I have read through your Welch Clocks - 2nd Edition several times and it really is a great book. The photograph of you and Vicky on the back cover is a nice touch. Best wishes to you for the balance of 2013..."
"...Everything that a collector, antique dealer or auction house wants to know about identifying a E. N. Welch or Welch, Spring & Co. is here in Tran's "Welch Clocks - 2nd Edition." The book is well organized and easy to follow. The "E. N. Welch Manufacturing Company" article by Chris Bailey is outstanding. The "Welch Clocks - 2nd Edition" will be the Welch bible for many years to come. Tran's great clock identification books should earn him the right to be made a Fellow of the NAWCC..."
"...I just received my order of your Welch Clocks - 2nd Edition and have gone through it twice already and it has sparked my interest to learn more about Elias Burwell and William and Luther Carter. I am the new person on the block having started collecting and researching production era American perpetual calendar clocks about 4 years ago. I quickly invested in almost all of your books and they have been a valuable resource..."
"...I received the Welch Clocks - 2nd Edition yesterday; it's a grand slam home run! Like your other books, it will be a great source of information that others have failed to provide. Your books inspired me to expand my novelty clock collection and I use them all the time..."
"...Tran - We have been friends for years and this is a special Welch book. You have printed one of the best books. I hope your health improves with time and we look forward to seeing you both at clock shows. Again, congratulations on the new Welch Clocks - 2nd Edition..."
"...Just received my copy of the Welch Clocks - 2nd Edition. it's great, just like the rest..."
"... Thank you so much for the Welch Clocks - 2nd Edition, and thank you for all your GREAT reference books over the years..."
"...Please know that within the library of my clock reference books is a copy of every clock book published by Tran Duy Ly. Naturally, the most recent edition of these Ly books, Welch Clocks – 2nd Edition, was promptly added immediately upon availability. I cherish this entire set of books as they have, through the years, proved to be absolutely essential. Frequently, clock enthusiasts will contact me requesting information regarding a recent clock acquisition or perhaps a clock they are currently pursuing. Usually I am able to respond to such inquiries by providing the makers name, model and/or serial numbers, dimensions, location and date of manufacture, original cost and estimated current market value. All this information seems to overwhelm the inquirer as they proceed to compliment me on my vast wealth of clock knowledge. Admittedly, I respond with, "it's not my vast knowledge whatsoever, the compliment belongs to the Ly family of clock reference books." I personally urge everyone to acquire a complete set of these invaluable reference books, then you too will become equally knowledgeable – thanks to Tran and Vicky Ly..."
"... Very nice to see you and Vicky in Ohio last week. I am enjoying my purchase: Welch Clocks - 2nd Edition, but I forgot to ask you to sign it for me! Thank you and enjoy your retirement. It will be a wonderful new chapter in your lives. I wish you a long, healthy and happy time..."
"... 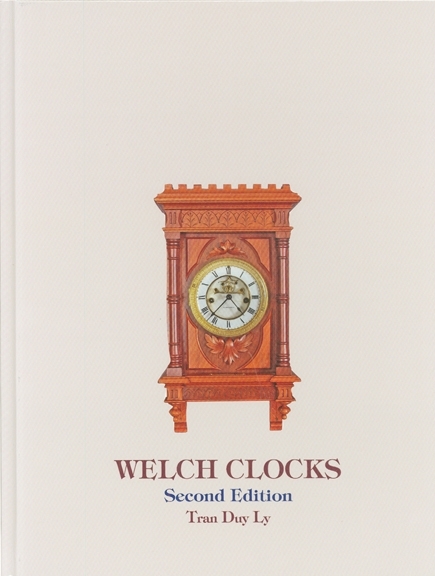 Your new Welch Clocks - Second Edition is another outstanding clock reference book. This book, along with all of your other fine clock books, provides a reliable source for antique clock identification, information and values. Your contribution to the study of clock collecting is second to none. Hopefully, you will have many more new books coming out in the future..."
R. O. Schmitt Fine Arts auction and your reference books have been an indispensable part of my education. Your contribution to the field is truly commendable..."
"... I want to tell you how great your new Welch Clock book 2nd Edition is. In one short line, "Its Great!" I have collected all your clock books and use them regularly for identification and information on different clocks. I am so happy that you have given your time, effort and money to produce such wonderful and comprehensive books for all the many clock collectors out there. Thank you, and your family, for all you have done to promote the wonderful hobby of clock collecting..."
My Welch Clocks Second Edition just arrived and it is every bit as beautiful and informative as all of your previous publications. The amount of information contained in these editions is fantastic. Although I am still partial to your American Clocks Volume Two with the special section on Self-Winding Clocks, I still want each one of your reference books for my horological library. This is another great contribution for both the serious clock aficionado and casual collector. Thank you Tran and Vicky for your continued commitment to preserving and especially expanding the available information for anyone interested in clocks and watches. "... Hi Vicky, just want you to know the Welch Clocks - 2nd Edition and the New Haven Clocks books arrived in perfect condition today. That was fast service and I am very happy to have them. I will be ordering more books soon. Thank you for your speedy, efficient service and these wonderful reference books..."
Norry Welch. It was a pleasure doing business with you. And I am grateful to my friends Fred and Penny Bausch at The Clocksmith for putting me in touch with you..."
"... Dear Tran. Many people work a lifetime in the pursuit of excellence and never achieve it. You, however, achieve excellence time and again-with each book that you publish. Your book, WELCH CLOCKS, Second Edition, is yet another contribution to your body of work that meets the test of the most discriminating horologist. Future generations will use your books to better understand their antecedents and their efforts to measure time. Congratulations!..." Copyright © 1977-2015 Arlington Books All rights reserved.